Picked up a great little paperback copy of ‘War Of The Worlds’ at lunch! I love the illustration on the cover – and the font! Everything, in fact. This particular edition is from 1967. I found the image here, a fabulous page dedicated to War Of The Worlds covers dating back from 1898. 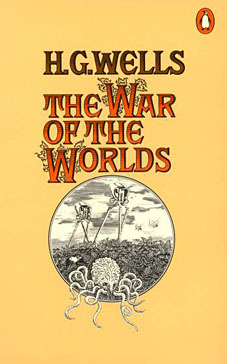 This entry was posted in It was the cover that caught my eye and tagged Book covers, War Of The Worlds. Bookmark the permalink. Post a comment or leave a trackback: Trackback URL. « Mini notebook – for necklace/key ring etc.